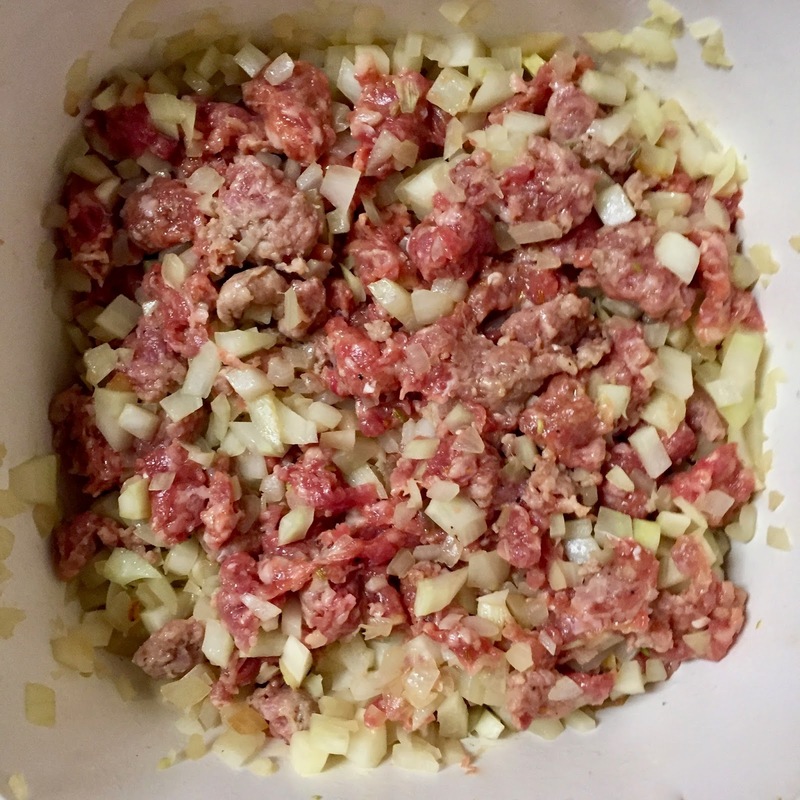 Or keep it refrigerated overnight and pop it in the oven for 20 minutes on Day 2. 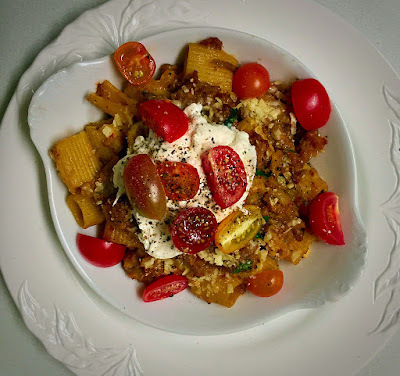 On more than one winter night at our house, pasta dishes have great appeal. Hearty and comforting, they’re hard to beat as winter warmers. 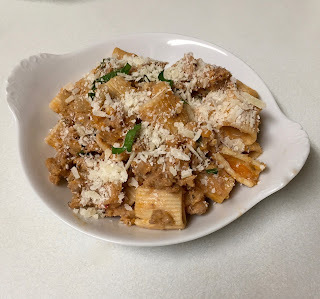 That being said, I’d be hard pressed to find a pasta recipe that does all that and comes together in as little time as this one. Whereas most pasta sauces are hours-long affairs, this one is positively stream-lined. It takes all of 45 minutes from start to finish. And there’s an added bonus here. You can eat it as soon as it’s ready. 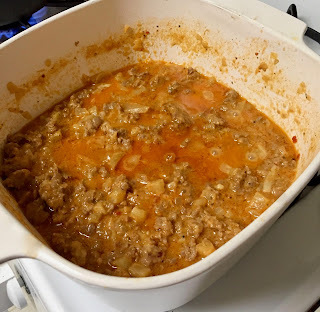 Or you can make it a day in advance, put it into gratin dishes, refrigerate them overnight and bake them the next day for all of 20 minutes. It’s another gem from Ina Garten in her most recent cookbook “Cooking for Jeffrey” (Clarkson Potter 2016). All I can say is Jeffrey is one lucky man. Dr. Garten’s Credentials are impressive to say the least. 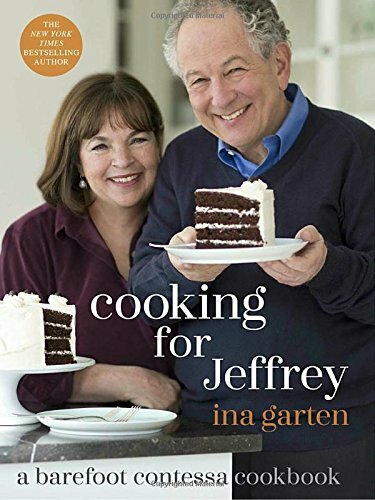 Jeffrey is Ina Garten’s husband. Every bit as successful as his wife, Jeffrey decamps from their home in East Hampton most weeks. 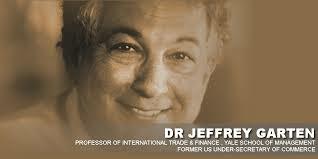 He heads to Yale University where he is Dean Emeritus of the Yale School of Management and still teaches 6 courses. This befits the author of five books on the Global Economy and stints with no less than four presidential administrations: Nixon, Ford, Carter and Clinton. He makes the four-hour drive back and forth twice a week. He has also been his wife’s greatest booster and we all owe him a debt of gratitude for encouraging Ina to go into the food business in the first place. And I’d include this recipe for Rigatoni in my thank you note. 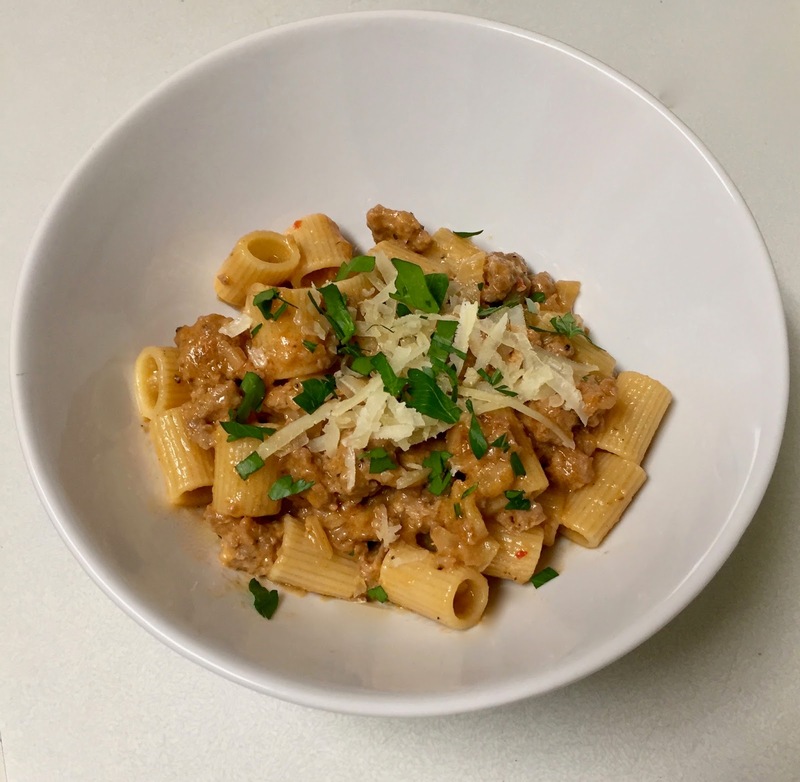 Recipe for Ina Garten’s Rigatoni with Sausage and Fennel from “Cooking for Jeffrey” Serves 6. Takes 45 minutes to make. 1. 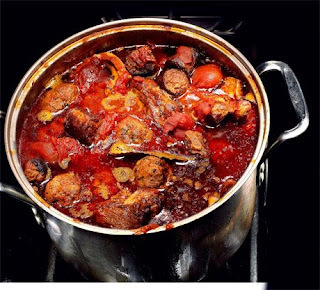 Heat the olive oil in a large, heavy pot or Dutch oven, such as Le Creuset, over medium heat. Add the fennel and onion and sauté for 7 minutes, stirring occasionally, until tender. Add the sausage and cook for 7 to 8 minutes, crumbling it with a fork, until nicely browned. 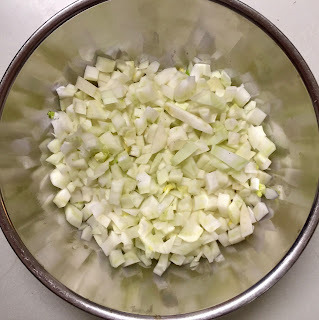 Add the garlic, crushed fennel seeds, red pepper flakes, 2 tsp. salt and 1 tsp. black pepper and cook for one minute. 2. Pour in the wine, bring to a boil and add the heavy cream, half-and-half, and tomato paste. Bring back to a boil, lower the heat and simmer for 20 minutes, until the sauce has thickened. Meanwhile, bring a large pot of water to a boil, add 2 tbsp. salt and cook the rigatoni according to package directions. Drain and add to the sauce, stirring to coat the pasta. Cook over low heat for 5 minutes to allow the pasta to absorb the sauce. 3. Off the heat, stir in the parsley and ½ cup of the Reggiano Parmigiano. Serve hot in shallow bowls with passing the remaining ½ cup of Parmigiano. 4. Alternatively, put the Rigatoni and sauce into gratin dishes, sprinkle with Parmigiano, refrigerate a day. Bake in a 375 degree oven for 20 minutes. 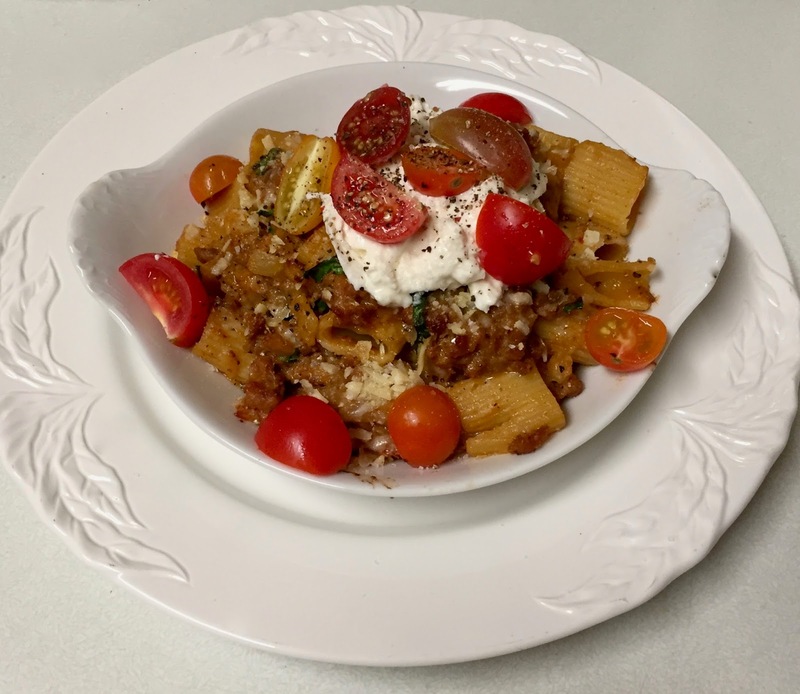 As you can see, I topped mine with half a boule of Burrata on each gratin dish and heirloom cherry tomatoes atop the Burrata.